Spear Capital has launched their second fund. Focus will be on commercially viable and scalable SMEs in the fast-moving consumer goods sector in Zambia, Zimbabwe, Malawi and South Africa. Breakfast seminar 16.01.18: Africa in 2018 - What to expect ? Norfunds Kjell Roland leder folk fra 17 forskjellige nasjonaliteter på tre kontinenter. Tydelighet er oppskriften for å lykkes med multikulturell ledelse. Próspero Microfinance Fund is awarded "Best for the World 2017"
Próspero, a Norfund investee, is recognized as one of the funds in the world that is best designed to create social and environmental good. I Afrika sør for Sahara mangler 600 millioner mennesker tilgang til energi. 116 nye kullkraftverk er under planlegging i Afrika og Midtøsten for å imøtekomme det økende energibehovet. Om vi skal lykkes med å stanse klimaendringene, haster det med store investeringer i ren energi. Why do DFIs use offshore financial centers? A newly published report, developed by the Overseas Development Institute (ODI), explains and evaluates why DFIs use offshore financial centers (OFCs) and recommends how this best should be done in the future. This week, Mozambique's president Nyusi visited Norfund's new investee, the Carthage papaya plantation. He was impressed and promised to "do what is needed to help the company grow". Scatec Solar ASA, KLP Norfund and partners have achieved financial close for six solar PV power plants in Egypt totaling 400 MW. DFID has decided to increase their capital contribution to the UK's Development Finance Institution, CDC, with an an amount similar to the full Norwegian aid budget for 2018. In the budget proposal for 2018, the Norwegian Government proposes an aid budget that is bigger than ever before. This includes a 12,5% increased capital allocation to Norfund. Today Statkraft and Norfund have closed an agreement to swap shares in their jointly owned international hydropower assets. Norfund has established a joint venture with the Myanmar group Yoma Strategic to provide solar power solutions to telecoms towers in Myanmar. 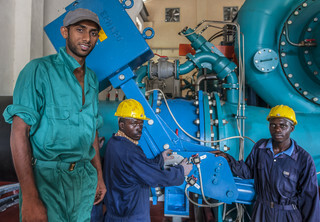 Through 14% ownership in rAREH, Norfund will contribute to the development and operation of several new small-scale renewable power plants in Africa. Other investors in rAREH are the Nordic Development Fund, Germany’s KfW and Switzerland’s responsAbility. A new development impact case study shows how the DFCU Bank has increased access to financial services for MSMEs in Uganda and contributed to more jobs.